This question may stop you dead in your tracks when asked in person. I know I used to stumble around this and fumble out a half hearted answer of how I just love photography. It wasn’t until I overheard my husband mention to someone that I was a photographer that it got me thinking…am I a photographer? Am I good enough to call myself a photographer? How do you know when it’s time to call yourself a photographer? I wish I had a concrete 3 step answer for you but I don’t. I do have some things for you to consider. Once I mastered some of these things, I slowly started to feel comfortable calling myself a photographer. Are you able to consistently create the kind of images you want? Have you moved past getting your exposure correct only by chance? I felt much more comfortable with calling myself a photographer when I was consistently getting the images to turn out how I wanted. Keep in mind your style may change and evolve as you evolve as a photographer and that is fine. I’m not suggesting that you have to know exactly what your style is. I know mine has changed over time. I’m a firm believer that the camera does not make you the photographer. Just because someone has a $2,000 camera does not mean they are a better photographer than someone with a $500 camera. We all know it isn’t the gear but the person behind it that creates the image (yes, great gear helps) but a good photographer can create stunning images with a DSLR or camera phone. The best thing you can do is learn to use what you have. Know the ends and outs of your camera. I often get asked when someone should upgrade their gear. I always say that you should only upgrade once you know what the new camera can do that your current camera can’t do. If you can’t answer that question you haven’t out grown your camera and don’t need to invest in a new body. If you don’t believe you are a photographer, neither will the people around you. I know I said my husband talked about me being a photographer which got me thinking and I’m blessed that he believes in me. That isn’t always going to the case. If you aren’t 100% confident in yourself yet then you know the saying…fake it till you make it. Seriously though, you need to have confidence in yourself, your skills, and your work. I really want to drive this point home. I thought for a long time I couldn’t call myself a photographer because I didn’t, nor did I want to, own a photography business. I was just a mom with a camera. However, there are MANY happy hobbyist out there who don’t own or no longer own a photography business and call themselves photographers. Now when I get asked if I’m a photographer, I quickly follow it up with, “Yes, but I don’t take on clients.” You may get a puzzled look from the person asking the question. That is fine. I inform people that I have a passion for teaching photographer and prefer teaching over working with clients. Whatever your reason, you don’t need to feel less like a photographer because you don’t own a photography business. 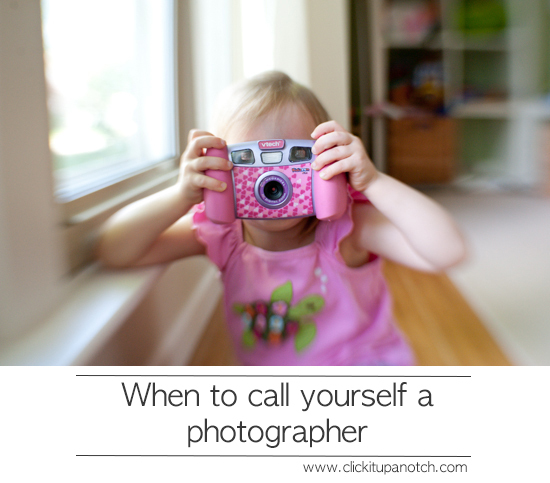 Tell me in the comments below when you knew you were ready to call yourself a photographer. Thank you for giving those of us who photograph as a hobby the freedom to call ourselves “photographers”. Great article! I usually say I am a hobbyist. I do like your “yes, but I don’t take clients right now” because of course everyone wants their photo taken and right now I only want to take pictures of things I want to take pictures of lol. A selfish hobbyist. Haha Bre, this had me laughing! Now I know I am!! My husband also said the same thing to people around, he always tells me how good I am with pictures. I always felt that I was someone who just love to have a camara on my hands. But now with what you said and with what he said YES!! I am a photographer. Thank you for this. I’m at that point where I’m ready to take on clients. Real paying ones. Which means, I’m confident to say that I am a photographer. I appreciate all the insights you have to give. The single mist important component of a camera is the 12″ behind it. Thanks so much for all your articles, they really inspire me and motivate me to keep moving forward in beeing a photographer, and must of all to call myself like that. I’ve been learning so many things since I’m following your posts, I am really gratefull. Thank you! For a long time I fretted about “taking the next step”. This site helped me realize that for me it’s not about being “pro”: I’m in love with “the journey” – that’s the single most important thing to me. I’m a hobbyist but I’d call myself “a photographer” in a heartbeat. It’s about the craft and the creation. I think I knew when I started coming up with more and more photos that required little to no editing. There are too many people that feel that the camera makes the photographer and that’s highly unfortunate. I shoot with a Fuji X-E1 and hear it all the time about how it’s not as good as a DSLR and the MP’s are way too low. Well I think my work speaks for itself and I saved a few bucks to be able to get other peripherals that I needed!! I was born a photographer. I have always called myself a photographer. I still don’t say “I am a photographer” every time people ask what I do. However, I became a little more confident with calling myself a photographer when I recently shot a newborn session and the photos turned out just like I wanted them to. For me, newborn, maternity, and child photography is the ultimate goal. Therefore, I was super proud when this session went well. Absolutely love this picture you posted! Wonderful article, thanks for sharing!!! I just love your blogs and I am so glad that I came across your site! Great article. I have always lacked the confidence to say I am a photographer, but now I can happily say I am! When I visited a camera club with my husband (also a photographer) and realised that I was taking photographs as good as any of those on display and without so much of their computer enhancement. I love striving for the perfect shot with just my camera. I started calling myself a photographer after I sold my first piece. I think for me it was a case of believing in myself. When someone else validated my work by paying for it, I finally felt I could call myself a photographer. Of course in reality I had been a photographer for many years. Great article thanks and hopefully it will give others the courage to take this step. I defined myself as a photographer, I guess, the moment I realized that photography mattered to me, and it mattered to me to a point where I wanted to capture my life through photographs. A second milestone was wanting to truly learn how to capture better images. that’s what I’ve heard all my life, and still lack the confidence! Everyone ask me if I’m a Professional Photographer, and I always respond with it’s a hobby. I started answering “yes” to that question when I got my first referral from a previous client. Referrals are the best compliments! I am so nervous to fail to meet the expectations of my clients that I set low expectations and undermine confidence others have in me. I really struggle with putting myself out there. I absolutely love visiting this site, all of the positivity and tips/tricks. Thank you! Thank you so much for this post; and everyone’s comments. Thank you for this blog. I realized I was a photographer when all my pictures since I was 5 have me holding a camera. Memories are all we have that is truly our own. Preserve ur past in a pic. Since getting serious about the craft about 6 years ago, I’ve grown tremendously. However, I’ve always referred to myself as a “picture-taker” because I didn’t have a clearly distinctive “voice” to my images. I so appreciate your article and the freedom it allows all of us who love and share the craft to walk in. I have indeed nailed all of your parameters listed above so effective today, I AM A PHOTOGRAPHER! Thanks for all you do…! This is such a great question (and a great article)! I started calling myself a photographer when I got past the point of wondering if I was going to get any good shots to KNOWING I was going to get good shots. The consistency is key. I was ready to call myself a photographer when I could look at my own work and be impressed with it, as well as be able to replicate the same look if I wanted it again. Thought provoking article – thanks so much for sharing! My husband, family members, and friends call me a photographer and although sometimes I feel like one, I frequently feel like a fraud! lol I usually amend the label with “student of photography” because I feel there is still SO much for me to learn. I am getting close to feeling more confident to call myself a photographer – just haven’t had that “aha!” moment. When I started getting enough requests for sessions that I decided to do a separate Facebook Page instead of using my personal one for people unrelated to me I decided maybe it was more than just “snapping a few photos”. 2015 is definitely a year of new focus in my “Hobby” for me! Great article. Reading it made me realize that I should probably work more on producing more work AND knowing my gear! I came across this article on your site while looking for info how to make photo coasters. This is a great article. While I can take and make a photo. I also stumbled with the very same question. While I’m a hobbyist by my definition I always told my self, I would when I sold my first print. But within the last two weeks. I’ve had inquiries and requests for jobs to consider. It was always my understanding that a “Professional Photographer” was someone who had an education in the field, a minimum of a B.A. in order to get jobs in the field working for companies, magazines, in advertising, etc. Don’t expect to get a job in a major company without a degree. Highly competitive field. Anyway, that would be my definition of a genuine professional photographer. Today, in the digital world, everyone thinks they are a professional photographer just because they took a few good landscape/wildlife photos and posted them on facebook and got a ton of “likes”. I have a friend who recently started selling her work and she does not even know the basics. She calls herself a photographer. Does not even know what “aperture” is!! I am a hobbyist. I might even call myself a photographer. I have even sold some stuff but I would never call myself a professional. There is just way too much I don’t know. Just because you can take better photos than your family and friends who find your work awesome compared to their snapshots does not make you a professional photographer. Clients will judge your work in comparison to other professional photographers, not to their snapshots. Sorry to be a downer, but everyone seems to think they are a photographer today. Hi, I don’t mean to sound wierd but I had something terrible happen with my own blog, and I’m warning people in my network because I don’t want to see others lose revenue. Thank you for the article; I’ve been asking myself this question for years. I started shooting as a teen, stopped for several years and picked it up again a few years ago with a Nikon D3300. I recently got paid as a videographer assisting a fellow fotog on a birthday shoot. I have been getting offers to shoot birthdays and baby showers and am teaching myself new things as I go along. I am getting close to retirement and plan on making this hobby a way of staying busy and possible making it a part-time business. I was reluctant to call myself a photographer but now that I am getting job offers, I guess I may be a photographer.